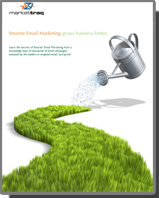 We’ve discussed using email marketing as a way to automate the lead nurturing process. But how do you figure out if those leads that are cycling through the top of the funnel are worthwhile to your company? Simply put, you would need to develop an effective lead scoring process. But First, What is Lead Scoring? Lead scoring is a method of assigning a point based relative value to each prospect that comes into your sales funnel. A set of criteria is assigned points, and those points are attributed by matching each piece of criteria with the qualifiers that a lead shows. These numbers do one thing: they quantify the likelihood of a lead turning into a customer. We reached out to our friend, Ashley Furness – a marketing analyst at Software Advice - to give us some additional insight into the importance of qualifying leads and setting up a systemized process for lead scoring. Why is it important for companies to have a systematized process for lead scoring? Lead scoring is all about marketing and sales team time efficiency. The system allows sales to immediately focus on those leads most likely to convert, while marketing nurtures only those that might eventually buy. At a result, sales and marketing don’t waste time on leads that are a poor fit from the start – or those where the company’s product doesn’t address their need, or they are not looking to buy. This ability is particularly important for companies with limited sales manpower. At the same time, lead scoring allows your team to continually fine-tune what defines the ideal customer. Lead metrics with the highest conversion rate will emerge as the most effective determinant of sales readiness, thus improving the efficacy of the lead scoring program. What are the main benefits of qualifying leads or finding FIT leads? Qualifying leads allows your team to act quickly on those leads with the best “fit” with your company. This means answering questions such as: Is it in the right market? Is it the right kind of company? Is this person the decision maker? Do they have the right kind of problem? Does our product solve that problem? Is our product within their budget? For example, the lead scoring system would trigger sales to jump immediately on an opportunity with the exact problem that your product solves, where the contact is the CEO. On the other hand, a lead that entered fake information into an online call to action would immediately be filtered from the sales pipeline. What’s one of the most common mistakes that companies make when they are setting up a lead scoring system within a marketing automation tool? Not tracking and responding to performance. A lead scoring program should be a constantly evolving schema. The metrics for scoring leads might stay the same, or be added to, but the weights for each should change. Also, not integrating behavior metrics into the scale. Qualifying leads through FIT is just one part. Next, marketing and sales need to score the lead based on what marketing touches have they responded to (webinars, calls to action, fanned on Facebook etc.)? Also, how did they enter the pipeline (called the 1-800 number, clicked a link on Twitter etc.)? Here again, the team should track what behaviors yield the highest conversion rates. What are some simple ways that companies can begin to start scoring leads? Start simple and grow the system as you gain more insight. First, make sure you have a means for answering a few FIT questions (mentioned in answer # 3 above) within your marketing calls to action. For example, if the prospect wants to download a whitepaper or sign up for a webinar, they must answer “How many employees do you have?” or “What is your title?” Based on those responses, your team can decide if that lead should be signed up for a drip campaign, or called immediately. If the opportunity is filtered into a drip email campaign, you have the basis to score behavior metrics. Lead scoring is an important part of the sales process, and an integral one for effectively dealing with incoming leads when setting up a marketing automation plan. With the right scoring system, your company can spend time responding to leads that display positive conversion qualities, and move leads that aren’t quite ready to convert into an automated nurturing campaign, saving your company both time and money in the long haul.